The demand for feature-rich Smart Tv applications is increasing at a rapid pace. Live video streaming services are gaining popularity because people are searching for platforms that can provide them with real-time entertainment. Developing applications for Fire Tv is fruitful for businesses because a lot of people are joining social media platforms to keep themselves entertained. Software Developers at Oodles Technologies build Fire TV media apps. These apps are based on Java and use Android Studio, Gradle and other Android Development Tools. Android tools (like Android Studio) and frameworks can be used to develop Fire Tv apps. Apps designed for Android Tv run smoothly on Fire Tv. Since Android Tv and Fire Tv use Android so one can push the same code to Amazon play store and Google play store. Pushing the codes helps increase views of the app and its usage. Amazon Fire Tv is versatile and gives high production over the widest range of applications. Open Command terminal and add ADB to your path. 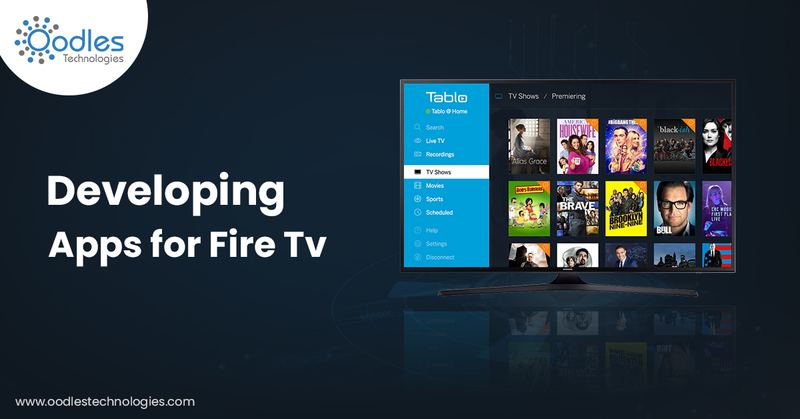 Amazon Fire TV App Developers at Oodles Technologies has experience in building feature-rich applications that are scalable, robust and feature rich. Directional pad center key with constant value: 23 (0x00000017). Directional pad left key withs constant value: 21 (0x00000015). Fire TV devices can be checked through the feature amazon_hardware.fire_tv. You can fetch the feature by calling the method getPackageManager() on the context and checking if hasSystemFeature() returns com.hardware.amaon.fire_tv. Fire Tv hardware offers support for 4K video output, support for HDR , 8 GB internal storage and 2 GB RAM. These powerful features defines that Fire Tv can run all sorts of apps, games and video streaming media. Are you searching for an Amazon Fire TV app Development company to assist you with developing an application for your business? Contact Oodles Technologies - one of the leading software development company in India. We develop an HTML5 web app for Fire TV within a short span of time. Whichever application we develop for Fire Tv are based on Java. Our developers create high-quality media apps with advanced added features. Each app our developers create ensure higher credibility of data. We use Android Studio, Gradle, and other tools common to Android development. Apart from building applications for Fire TV, we build Android Apps, SaaS Apps, Blockchain apps and more. For complete assistance on app development contact our expert now!